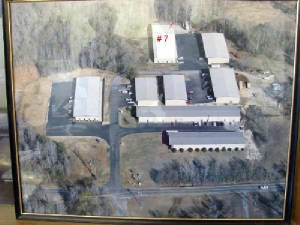 BELOW is an AERIAL VIEW of EXACTLY where we are located in ZIMMER BUSINESS PARK. CONTINUE to drive SOUTH...INTO...SOUTH CAROLINA!! Traffic Light and 2 Gas Stations will both be on your right at intersection of 160. AND...At the NEXT POSSIBLE LEFT intersection WITH A LEFT TURNING LANE...APPROX...(less than)...1/2 mile away...TURN LEFT at the TRAFFIC LIGHT onto MARVIN ROAD (There is a SINGLE LEFT-HAND TURNING LANE, and an EXXON GAS STATION on your FAR Left) and there is an ALDI's ( Grocery Store) at the SAME LIGHT, too, at Marvin Road. DRIVE approx 1/2 MILE...DOWN-HILL...and at the BOTTOM of the HILL...TURN LEFT INTO... ZIMMER BUSINESS PARK ..."TIME AFTER TIME" CLOCK SHOP is on the DIRECTORY SIGN when you come in. TAKE...TRUCK ROUTE 160 / ROUTE 460...EAST...and follow it STRAIGHT for only 5.3 MILES. TURN RIGHT...HEADING SOUTH...on HWY 521...drive approx (less than) 1/2 MILE...and TURN LEFT on MARVIN ROAD (TRAFFIC LIGHT...SINGLE LEFT-HAND TURNING LANE...and an EXXON GAS STATION) and there is an ALDI's ( Grocery Store) at the SAME LIGHT, too, at Marvin Road. DRIVE approx 1/2 MILE...DOWN-HILL...and at the BOTTOM of the HILL...TURN LEFT...(opposite Henry Harris Road)...INTO... ZIMMER BUSINESS PARK ..."TIME AFTER TIME" CLOCK SHOP is on the DIRECTORY SIGN when you come in. PLEASE REMEMBER...that "TIME AFTER TIME" CLOCK SHOP is OPEN EXCLUSIVELY by APPOINTMENT...so CALL 704-618-3592 to schedule your appointment! "Time After Time" is in UNIT #741, "X" marks the spot on the photo above!